[email protected]: President George H.W. Bush led a long, successful and beautiful life. Whenever I was with him I saw his absolute joy for life and true pride in his family. His accomplishments were great from beginning to end. He was a truly wonderful man and will be missed by all. During today's meeting @POTUS and Merkel "exchanged thoughts on Russia's violation of the Intermediate-Range Nuclear Forces Treaty and explored how to strengthen the NATO alliance further as well as how to improve European energy security," says @PressSec. 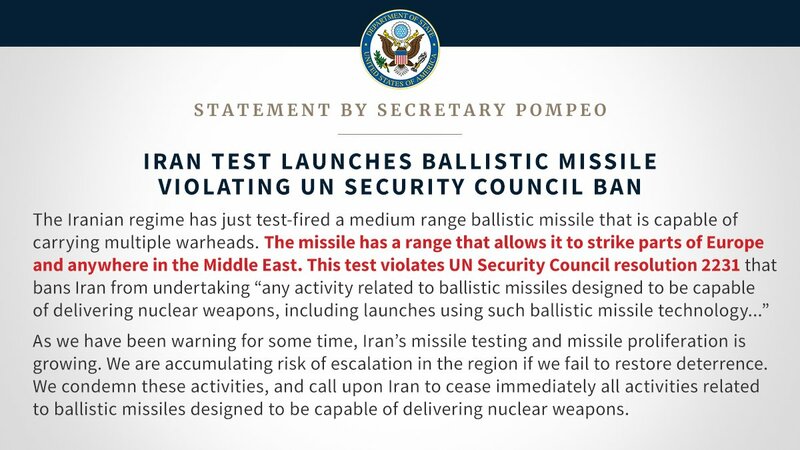 Department of State @SecPompeo: Iranian government just test-fired a medium range ballistic missile capable of striking Europe and the Middle East. This violates UNSC Res. 2231. Iran's missile testing and proliferation is growing. We are accumulating risk of escalation if we fail to restore deterrence. [email protected]: .However, out of respect for the Bush Family and former President George H.W. Bush we will wait until after the funeral to have a press conference. [email protected]: I was very much looking forward to having a press conference just prior to leaving Argentina because we have had such great success in our dealing with various countries and their leaders at the G20. @POTUS, @FLOTUS were "notified late last night of President George H.W. Bush's passing. President Trump is scheduled to speak with President George W. Bush this morning and offer his condolences on behalf of himself, the First Lady, and the entire country," says @PressSec. President Trump on the death of former President George H.W. Bush: "Melania and I join with a grieving Nation to mourn the loss of former President George H.W. Bush, who passed away last night." [email protected]: @seanhannity on @FoxNews NOW. Enjoy. [email protected]: Great day at the G20Summit in Buenos Aires, Argentina. Thank you. 6 Trump admin. officials violated the Hatch Act after they tweeted support for Republicans or President Trump on their government Twitter accounts, but no disciplinary action, government watchdog agency says. [email protected]: Great reviews on the USMCA - sooo much better than NAFTA. [email protected]: To the Great people of Alaska. You have been hit hard by a "big one." Please follow the directions of the highly trained professionals who are there to help you. Your Federal Government will spare no expense. God Bless you ALL. [email protected]: Just signed one of the most important, and largest, Trade Deals in U.S. and World History. The United States, Mexico and Canada worked so well together in crafting this great document. The terrible NAFTA will soon be gone. The USMCA will be fantastic for all.